Browse this category to finds and download many of the example projects from my book, 3D Printing for Model Engineers, to be published early in 2018. Since the release of the first commercially available 3D printer in 2009, a thriving consumer market has developed, with a huge variety of kits now available for the home constructor. In their short existence, these printers have developed into capable machines able to make robust and useful objects in a wide range of materials. 3D Printing for Model Engineers - A Practical Guide provides the first truly comprehensive guide to 3D printing in the context of other creative engineering-based hobbies. It covers using 3D Computer Aided Design; 3D printing materials and best practice; joining and finishing 3D printed parts; making your own metal castings from 3D printed parts and building your own 3D printer. Filled with real world examples and applications of 3D printing, this book is based on practical experience and is the essential guide to getting the most from your 3D printer. Illustrated throughout with 446 colour images. I uploaded this simple little building to Thingiverse and was astounded by its popularity! This 3D printed bench lamp has a lithium battery and charger in the base. It uses an acrylic magnifying lens from Astromedia. LED ring lights are available from a vast number of eBay and other sellers! You will need a metal plate for the base, together with M6 screws and nuts from Screwfix or Toolstation. The standard Prusa i3 Spool Holder is a wonky and rather useless assembly of threaded rods joined together by a loose bar and some hope. This alternative holder is better than most as it only has four 3D printed parts, two side cheeks and two rollers. It uses four cheap 608 skate bearings, two in each roller - these should be pressed in using a vice. The spindles for the rollers are a pair of 110mm long M8 coach bolts and nuts (try B&Q). Print the rollers on their small ends and make sure the bottom bearing sockets are clean of loose filament. Fits are deliberately tight (tap in) to give a good, rigid, assembley, but those who don't like things too tight can increase sizes by 1-2% in X and Y. Don't overtighten the screws or the rollers will be too stiff. Sizes suit a Factory 3D Prusa with a 6mm thick frame, but just stretch the clips to suit your printer. Holes in the bottom of the clips can be used to take a loop bent out of a TIG welding rod, but experience shows this is unlikely to be necessary. A standard Skywatcher 9x50 finder scope is often a popular and successful choice for a guide scope, used with a suitable camera. But the standard finderscope bracket is a bit flimsy and the scope to T-mount adaptors are a bit pricey! As an alternative, here are two STL files. One is for a robust mounting bracket with a standard Vixen/Skywatcher dovetail to suite any scope with a barrel about 50mm or so in diameter. Use it with six Nylon M6 screws. 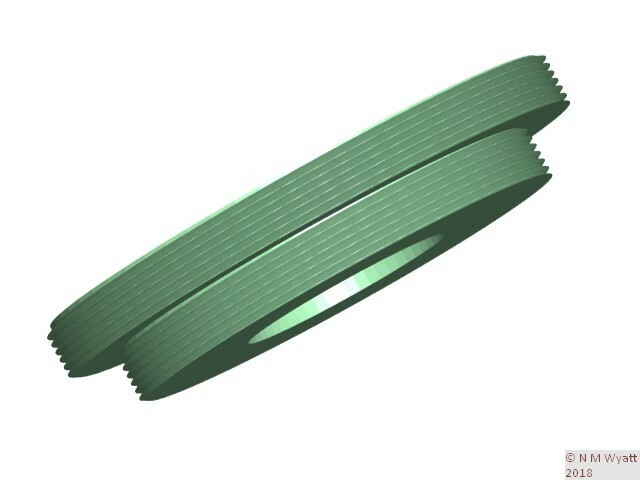 The other is a T-mount adaptor that fits the internal thread left when the eyepiece fo a Skywatcher 9x50 finderscope is unscrewed. It does not suit Celestron finderscopes which apparently have a 1mm pitch thread. It should allow any t-mount fit astro camera such as a ZWO to be brought to focus by adjusting the front lens. Print the parts large end down. I suggest 1.2mm wall thickness and 25% fill. the threaded adaptor will benefit from 0.06mm layers if your printer can do them. Take care when first threading the adaptor, it may be a little stiff at first, especially if your printer over-extrudes, and take care not to cross-thread it. Lunokhod 1 and 2 were a pair of exceptionally successful robotic moon rovers that the Soviet Union sent to the moon in 1970 and 1973. Owing to the politics of the time this remarkable achievement went largely unnoticed in the west. The eight-wheeled rovers were about the size of a small car, and in fact they were intended to act as safety/escape vehicles to support manned lunar expeditions. Lunokhod '0' was destroyed when its launch vehicle exploded in 1969, but Lunokhod's 1 and 2 were successful. Lunokhod 3 was never launched and is on display in the Lavochin Museum. I had a fascination with the Lunokhod program as a youngster, fuelled by the almost complete lack of information about the missions. When I got a 3D printer I discovered that no-one appears to have made one before, although there are some excellent conventional models. So I put that right and made my own Lunokhod 1. 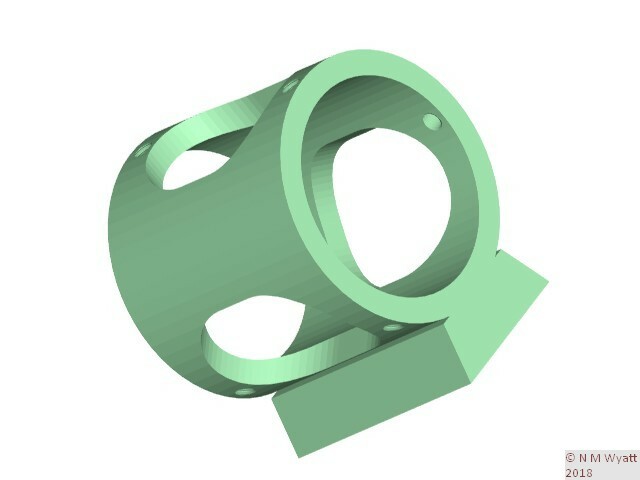 You can download STL files to print your own Lunokod using the link at the bottom of this page. My model is based on the exceptionally useful plans at spacemodels.nuxit.net/lunokhod and I fully acknowledge Vincent Meens as my main source for dimensional and constructional information on the Lunokhod. 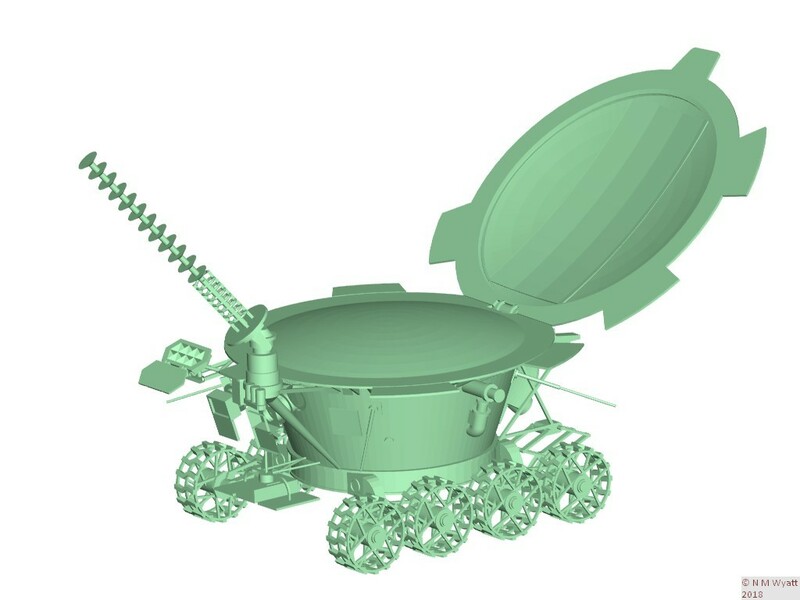 That said, the pdf files on his website were unsuitable for making a 3D digital model, so I redrew the rover entirely in TurboCAD from scratch. I have modelled Lunokhod 1, as I was becoming stir crazy and did not have the patience to add all of the extra accessories for Lunokhod 2. I have not yet finished painting Lunokhod, I will add a photo when the job is complete. A note on the STL files. I hate the poor quality STLs on many 3D sharing sites that are impossible to print. All of the STLs in this zip folder have been printed at actual size (dimensions in millimetres) WITHOUT SUPPORTS. That said, many of the parts are not in an optimal orientation for printing and will need to be arranged to suit your printer. The low gain antennae. these are just too thin to print, I suggest you use four bits of wire. The lid, which needs to be rpinted as two halves on tehir sides, and glued together - you can see the seam in the photos. The model of Lunokhod as a whole, this is just to give you a guide as to how it should look. You WILL need to be careful and creative in the use of cyanoacrylate glue to put everything together. I have NOT included assembly instructions, reference to Vincent Meen's drawings, photos of Lunokhod 3 and the STL of the assembled Lunokhod should be enough to guide you in assembling the model. My basic print settings were PLA, 0.14mm layers, 0.56mm top and bottom layers, 25% fill and 0.8mm skin width (0.4mm nozzle). The printer was my Prusa i3 made from a Factory3D kit, these are UK made and rather better than the stock acrylic frame kits and cost about 50% more. Lunokhod 1 3D by Neil Wyatt / Stub Mandrel is licensed under a Creative Commons Attribution-ShareAlike 4.0 International License.